The move marks a landmark victory for LGBT Liberation groups who fought tirelessly since the alum told a Tory Party fringe audience that gay relationships “should not be put on the same level” as straight ones. The Principal Ed ‘Babe’ Byrne met with tenacious leader of the KCL LGBT Liberation Association Ben Hunt on Tuesday morning and agreed there was a need to refresh the windows. “The Principal has asked me to compile a list of new alumni for the window in suggestions,” he added, saying a committee will be formed to decide on the new alums. KCL are framing the removal of Lord Carey’s picture as part of a necessary (and long-planned) redevelopment, but it’s quite clear to anyone with half a brain cell what’s going on here. Pale, heterosexual Christian alumni – no matter how distinguished – must give way to greater LGBT and BME representation, no matter how relatively undistinguished. 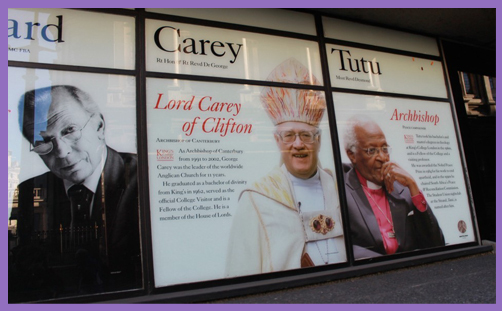 “The Principal has asked me to compile a list of new alumni for the window..” It is subjective minority hero-elevation; exaltation by student petition (or persistent criminal damage, since Lord Carey’s picture is repeatedly defaced with graffiti) . Only by Orwellian “doublethink” can the LGBT activists who attacked Carey carry the baton of tolerance. Their world is framed by identity politics, with positive discrimination for those of favoured status, while any unfavourable attributes (as arbitrarily determined) are open to attack. The 1829 Royal Charter states that the purposes of King’s College are to maintain the connection between ‘sound religion and useful learning’ and to teach the ‘doctrines and duties of Christianity’. The AKC remains faithful to this commitment to the importance of religion, and aims to promote intelligent, open-minded reflection on religious, philosophical and ethical issues. What is sound religion if it may no longer even express orthodox belief, biblical doctrine or traditional moral theology? What intelligent, open-minded reflection is possible if academics just cave in to the latest ethical fad, and obligingly expunge all ‘offensive’ material from sight for fear of bad publicity? What reasoned debate is possible if one side is so ‘deeply offended’ by another’s religious or philosophical beliefs that they run screaming to the principal instead of arguing their case? Perhaps, as ex officio Visitor to the College, Justin Welby might intercede for the restoration of Lord Carey, or, failing that, reconsider the relationship KCL clearly enjoys with the Church of England and Lambeth Palace.